West Virginia's Teachers Walk Off The Job, Protesting Low Pay And Benefit Cuts : The Two-Way Teachers formed picket lines and descended on the state Capitol to demand higher salaries and better insurance. The state has some of the lowest teacher pay in the country. Jennifer Hanner, a first-year teacher from Harts, W.Va., holds a sign Thursday at the Capitol in Charleston. Teachers statewide went on strike Thursday over pay and benefits. 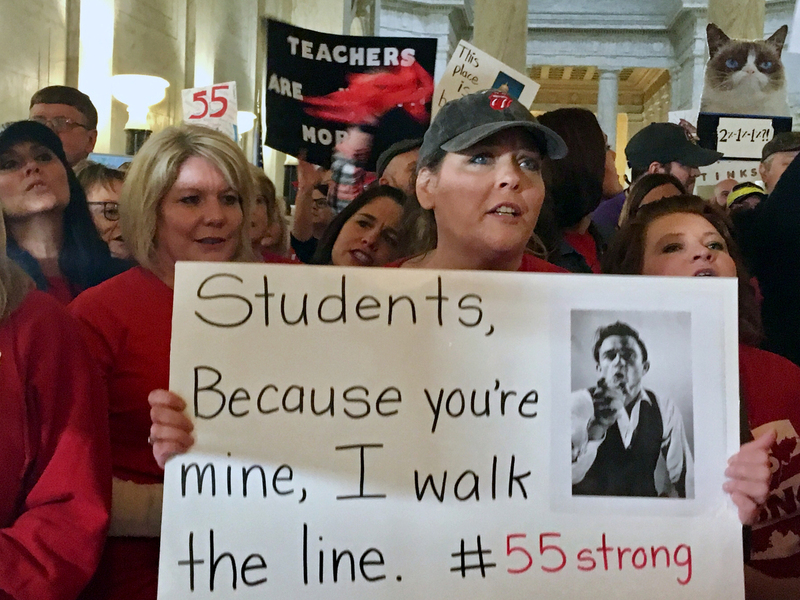 West Virginia's public schools were closed Thursday, as teachers across the state walked out and protested for better pay and benefits from state lawmakers. Gov. Jim Justice signed a bill Wednesday to give teachers a 2 percent pay raise starting in July, and an additional 1 percent pay increase in 2020 and 2021. "We need to keep our kids and teachers in the classroom," Gov. Jim Justice said in a statement­ Wednesday. "We certainly recognize our teachers are underpaid and this is a step in the right direction to addressing their pay issue." As the Charleston Gazette-Mail reports, teachers say those increases amount to little after hikes to insurance premiums and cuts to their benefits. At the governor's request, the state's Public Employee Insurance Agency approved a 16-month freeze on premiums and benefits. The state's teachers last staged a statewide strike in 1990, and striking employees could face a range of legal consequences. The state's attorney general issued a statement that the work stoppage is unlawful and he was ready to assist state agencies or boards to enforce the law. On Wednesday, students at schools in 12 counties wore purple in solidarity with their teachers. And Thursday, thousands of demonstrators showed up at the Capitol in Charleston, the Gazette-Mail reported. "When we went to the Board of Education's website last night and saw the entire state was red — that was amazing," Heather Ritter, a librarian at Scott High School told the Gazette-Mail. "They weren't unified in 1990, but we are today." Salary for a beginning teacher in the state is $32,435, and the average teacher salary is $44,701, according to the National Education Association. That ranks the state 48th in terms of teacher pay, The Associated Press reports. West Virginia has a hard time retaining talented teachers. Former Ohio County teacher of the year Heidi Hohman told the Wheeling Intelligencer she had mentored eight "excellent" student teachers, but all had left to teach in states with higher starting salaries. "It's an insult to every public employee, school teacher, and service personnel at how little we value them," Del. Isaac Sponaugle, a Democrat, told West Virginia Public Broadcasting. "I've compared it to handing out Christmas hams. We're giving them nothing. ... Their insurance, we haven't made it a priority. We haven't made pay a priority but we want to cut taxes and continue cut taxes for businesses." House Finance Chair Eric Nelson said there wasn't room in the budget to meet the teachers' demands. "We've done as much, fiscally, as we can in this budget right now," said Nelson, a Republican, told the broadcaster. "We'd all like to do a lot more but we've got to work within the body of what we have. And we've heard them. We've put a lot on the table very quickly in front of other things. And you know I guess everybody has a voice but there are many other people out there too that, you know, we're all hurting in many ways."